Go east, young man. Veer left at the Orwell stroke Elizabeth Hotel to take the High Road, then Cliff Road, then Ferry Road (see BoytonBoy's map). Through the golf course, past the martello towers (x2) and keep going until you can go no further. Welcome to pay & display Felixstowe Ferry, home of the eponymous Ferry Cafe. 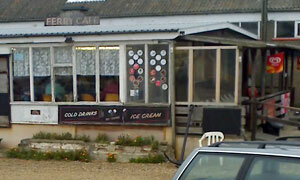 Cult caff, this, a little like Woodbridge's very own Caravan Cafe with its rickety, ramshackle, unapologetic facade. Yet peruse the unexpectly well presented menu and you'll find a pride in the locally sourced grub. None of that fancy waiting at tables stuff here, ta very much. Find a free table with Heinz and HP, queue up, place your order, leave a surname and ready yourself for the shout in five minutes. Choices choices: while Grenvyle went for the ever popular F&C (large portion or was his plate too small? ), I opted for a pair of Dingley Dell sausages, a Snape egg and numerous chips. Very much did the job, washed down with an incongruous apple juice from James White that would have seemed more at home in an NT tea room. By 1pm-ish, the joint was jumping, inside seating at a premium. There's a handful of outside benches if you're from the North or have unruly children. Meantime, that carrot cake wasn't going to eat itself, and it's a simple pleasure to be served a mug of tea c/w floating tea bag, confirming that pots are for girls. Afterwards, you could go to Bawdsey or buy a crab or throw stones in the sea or view some art or walk inland. We, alas, returned to the office. If it was a car -- VW Camper. If they were passing by -- John Wilson.